The exhibition examines cultural exchanges from the mid-sixteenth to the mid-seventeenth centuries through the movement of goods on Portuguese ships. Portuguese freighters traveled from Portugal to Japan in a four-year roundtrip that included extended stopovers in India and China. 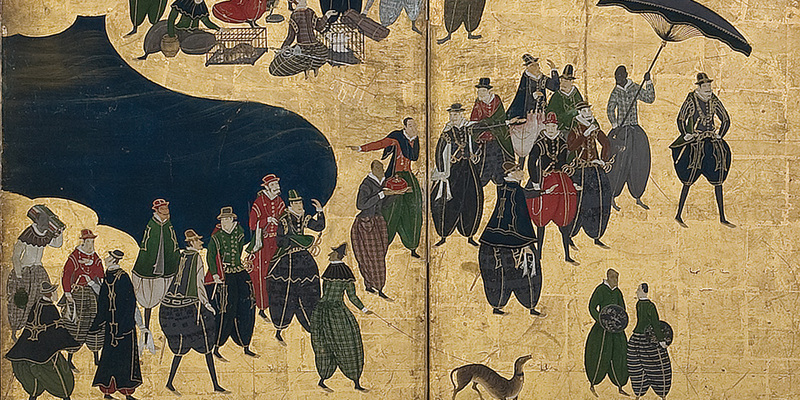 Central to this narrative of trade and cultural exchange are seven magnificent folding screens depicting Japanese encounters with the so-called "nanban-jin" ("southern barbarians"), who were mainly Portuguese sailors and Jesuit missionaries. Examples of the many types of objects depicted on the screens are also on display, including elaborately decorated Japanese furniture, lacquerware, and military equipment; Indian and Chinese ceramics, textiles, and furniture; and paintings by Jesuit-trained Japanese artists. Along with rare European and Japanese maps, the artifacts and screens tell a fuller story than that documented in contemporary texts and letters. Portugal, Jesuits, and Japan highlights a period of internationalism that gave way to insularity following the expulsion of the Portuguese from Japan in 1639. The viewer travels through the complex landscape of religious ideas, customs, and artistic styles that typified the nanban period as an age of exploration—when merchants and missionaries alike, both European and Japanese, saw spiritual beliefs and earthly goods as inextricably bound. The seventy works in the exhibition have been drawn from institutions and private collections in the United States, Portugal, Great Britain, and Brazil. An accompanying publication comprised of essays by art historians and historians, edited by Victoria Weston, includes color reproductions of all works in the exhibition. Organized by the McMullen Museum Portugal Jesuits, and Japan has been curated by Victoria Weston and Alexandra Curvelo in consultation with Pedro Moura Carvalho. The exhibition has been underwritten by Boston College, the Patrons of the McMullen Museum, Leslie and Peter Ciampi, the Camões Institute of Cooperation and Language/ Ministry of Foreign Affairs of Portugal, the Consulate General of Portugal in Boston, and the Calouste Gulbenkian Foundation, with additional support from the Luso-American Foundation.